Our two trips to Cambodia could not have been more different from each other. In July 2008, we were on a Round The World Trip (one year), and therefore on a somewhat tight budget (between Backpacking and Flashpacking). However, since Cambodia was the last country we visited, we treated ourselves to better hotels and hardly ever ate at the markets as we used to do in other countries. In July 2008, we crossed the border from Laos on foot and checked out mainly Phnom Penh and of course Siem Reap, where we spent one week exploring many Angkor Temples. We finally crossed Tonlé Sap to Battambang before heading overland to Thailand. In December 2014, we first spent one week in Siem Reap to see the most famous and the more remote temples of Angkor. We then made a 10 day loop through the Northwest of Cambodia, where we were mostly the only tourists. The common trip ended with several days in Phnom Penh, before Gilles headed alone to Kampot & Kep on the Coast and finally to Vietnam. The means of transport you choose in Cambodia will influence your expenses a great deal, to a greater extent than in neighboring countries for example – Undeniable, when comparing our two trips! If you upgrade to Mid-Range Guesthouses, the price climbs naturally, but less than in other countries – In terms of accommodation, Cambodia is extremely cheap: we actually never paid more than 20 € except in Siem Reap! And last but not least, Botanica Guesthouse (Kep) – this was definitely one of the best accommodations (guesthouse) we have ever stayed in! It will definitely find its way into our top 5 worldwide! The Golden Banana (Siem Reap) – even though they have significantly increased prices, this place still is an oasis of quietness, THE place to relax in Siem Reap for a reasonable price. Kratie Santepheap Hotel Hotel Double Room 10,00 N.A. Phnom Penh Pho Paris Hotel Hotel Double Room 14,00 N.A. Food is not as cheap in Cambodia as it can be in its neighboring countries (like Laos & Vietnam). Especially international cuisine will weight on your budget. For the mid-range type if travel, it is quite cheap, though. Riverside Balcony Bar in Battambang, on the banks of the river – a great place to enjoy excellent drinks at sunset. 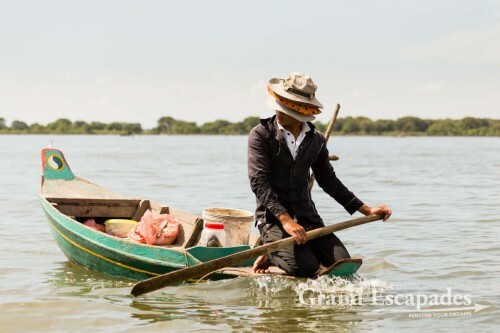 See the part “How To Go Off The Beaten Track” in our Travel Guide To Cambodia. True, mid-range guesthouses are significantly more expensive than hostels, but all in all you can find pleasant accommodation for a very reasonable price. The same applies for restaurants, where you can enjoy really good food. Why not sample some international cuisine after a while, to accommodate your palate with something familiar? You can save a lot of money on accommodation in Cambodia, as the comparison between our trip in 2008 (Backpacking) and 2014 (Mid-Range) clearly shows. Moreover, a great way to cut costs and to enhance your mobility and flexibility is to rent a scooter or a motorbike once in a specific area (especially in and around Siem Reap and on the Coast). There is no need to be a very experienced driver to tackle the road conditions there. Just be careful and do not overestimate your driving skills if riding a scooter is something new to you!